Today, I am going to tell you a story. Its a detective story with eight witnesses — each with a different point of view. In any case, let us watch the trailer. I got the idea about today’s talk from this movie. And so, I am going to introduce to you eight witnesses in this story. Each has a different point of view. We are going to take one company — whose name shall soon be revealed — and then we are going to look at this company from the vantage point of each of these eight witnesses. The basic idea borrowed from the movie is that we get closer to the truth when we have multiple vantage points. As we move from one vantage point to the next, you will get a piece of the puzzle. When you have seen all the eight vantage points, you will have all the pieces of the puzzle. You will get closer to the truth. During this mystery—solving exercise, you will also recognize a few academic financial ideas and beliefs. You will see them crumble in the face of evidence. In the end, you will see a more clearer picture of reality than would have been possible otherwise. Our first witness is a business analyst. He is not trying to value the company. Rather, his job is to evaluate whether this is a great business or not. How would he do this? First, he would look at the company’s balance sheet, an extract of which is reproduced below. Notice, you don’t know the name of the company yet, and you won’t for a while. Let’s keep the suspense on. What do you see? Let me tell you what I see and while I see this stuff, some questions will arise, to which I would like to know the answers in due course. That’s part of the puzzle we are trying to solve, right? I see a company which, as of end of March 2011, employed Rs 247 cr of assets. Out of these, Rs 139 cr was deployed in net fixed assets. The first question that comes to my mind is whether the company is fixed capital intensive? Well, I don’t know the answer to that question until I get to compare the amount of fixed assets employed with annual revenues of the company. That’s what capital intensity (or fixed asset turnover) means — number of rupees of fixed assets required to produce a rupee of revenue. So, I don’t know yet if this business is fixed capital intensive or not. But I soon will. Lets move forward. What else do I see? I see the company is sitting on investments worth Rs 190 cr. I have a whole lot of questions about that. What are these investments? Are they marketable securities? (Yes) Are they money parked in debt mutual funds? (Yes). Are they surplus to the needs of the business? (Yes). What else that is important do I see on the face of the balance sheet? I see a negative working capital of 95 cr. Many questions arise. Why is working capital negative? Is this is a company which is running out of cash and is therefore, distressed? Hmmm. I know the answer to that one and the answer is no. How did I arrive at that conclusion? Think about this for a moment. Let me tell you how I arrived at that conclusion. One piece of evidence is the presence of Rs 190 cr. of investments. As I look deeper in the investment schedule of the balance sheet, I find that almost all of this money is parked in money market mutual funds and therefore, is as good as cash. If this company was financially distressed, it won’t be sitting on so much of cash, would it? The second piece of evidence that supports my hunch that this is not a financially troubled company, is to do with something that is missing on the balance sheet. Can you guess? 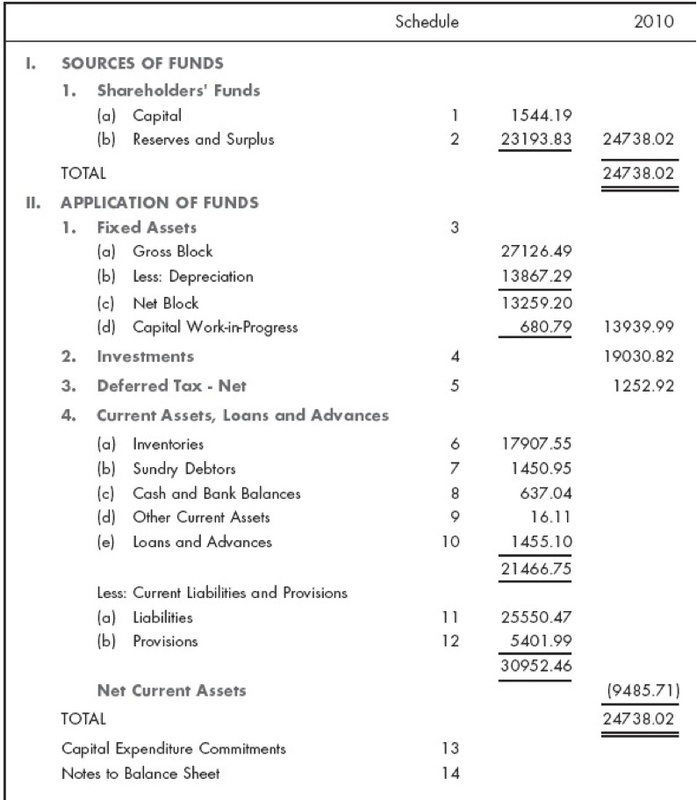 Take a look at the balance sheet again. What do you don’t see? Debt! There is no debt! If this company was financially troubled, you should have seen a lot of debt on the balance sheet. But there is no debt! The absence of debt proves that this company is not in distress. You see, sometimes what you don’t see is terribly important. That’s a useful principle to keep in mind. Most people overweigh what they see and underweigh what they don’t see. But you’re not going be like most people, now, are you? Working capital can only be negative if current liabilities exceed current assets. So what part of current liabilities contributes towards negative working capital. Let’s take a look at the current liabilities schedule. Notice that the company has sundry creditors of Rs 161 crores which, when compared with the total of inventories, receivables and cash on the current assets (see the balance sheet) would still result in a positive working capital. However, there is one item pertaining to Advances from Customers of Rs 92 cr in the above schedule which explains why working capital is negative. So it appears that this company has an extraordinary business which is supported by our earlier two discoveries: the presence of substantial surplus cash held as investments, and the absence of debt. Great businesses are much more likely to have the winning combination of: (1) being debt-free; (2) being cash rich; and (3) with a negative working capital. For example take a look at the balance sheet of two great businesses – Colgate and Hindustan Unilever- and you will find the same pieces of evidence. So what have we discovered so far when we put ourselves in the shoes of a business analyst? We have discovered that this company is well financed and probably has a solid business model. Let’s move forward with our analysis. By looking at the equity schedule we find that company has 1.54 cr shares of Rs 10 face value. Since there is no debt, we can take the total assets of Rs 247 cr and divide by 1.54 cr shares to arrive at the per-share book value of Rs 160. Next, as business analysts, we want to determine the average capital employed in the company’s operations over the last few years. For that we need to look at figures given in the tables below for fixed assets as well as working capital. Using the figures in the above table, we calculate average fixed assets employed in the business over the last six years. This comes to Rs 109 cr. Similarly, we calculate the average working capital employed over this period. This comes to a negative Rs 83 cr. Deducting Rs 83 cr from Rs 109 cr, we find that on average the company employed only Rs 26 of assets over the last six years. The first thing that catches my attention is the total revenues of Rs 1,125 cr. “My god!” I am thinking. This company employs, on average, only Rs 26 cr in assets but has revenues of more than Rs 1,000 cr! Wow! So, now we have the answer to the question I had asked in the beginning: Is this company capital intensive? The answer, of course, is no. Can you guess what this business could be? Let me fix my earlier error. I should compare net revenues after excise duty with capital employed to determine capital intensity. Net revenues of Rs 472 cr were produced by employing, on average, only Rs 26 cr of assets. So even after fixing my error, our conclusion that this business is not capital intensive is still valid. The capital turnover ratio of 18 times (472 cr/26 cr) implies very low capital intensity. What other conclusion can we draw from this analysis? When capital turnover ratio is high, the company can afford to have a low margin, and still deliver an exceptional return on capital. That’s basic “du-pont analysis” you have read about elsewhere. That analysis, you will recall, involves splitting Return on Invested Capital (Profit/Capital) into two components: (1) Margin (Profit/Revenues); and (2) Turnover (Revenues/Capital). In case of our company, we already know that Capital Turnover is 18. So, even if the company operates at a 5% margin, it can earn a 90% return on capital! Not bad at all. The big lesson here is that not all low margin businesses are necessarily bad. So next time, you meet someone who tells you that his business has very low margins, ask him or her about its capital turnover ratio, before making any judgments about the quality of the business. The next step for us is to see what’s the margin earned by our company. 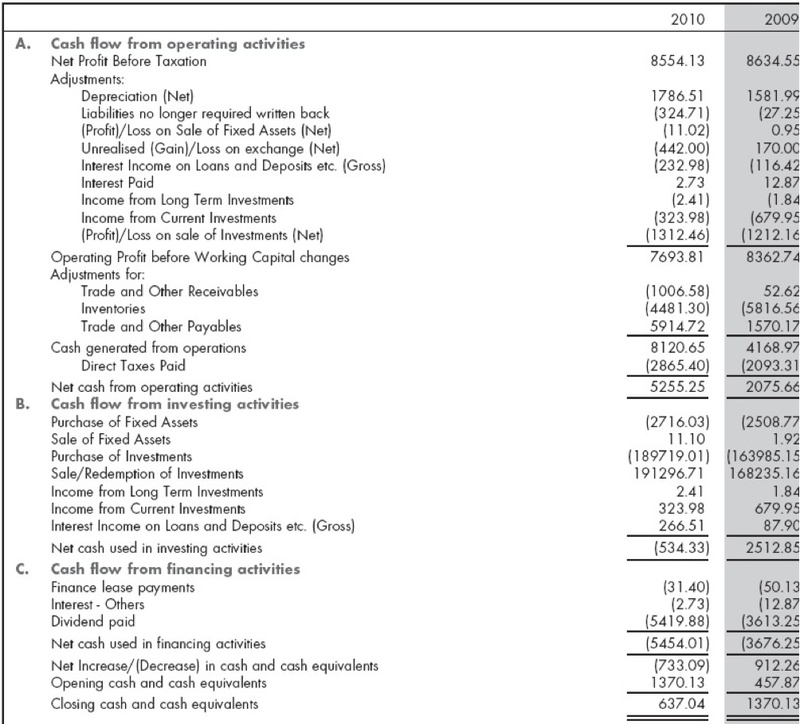 Take a look at the income statement again. From the Rs 98 cr of total profit before taxation and exceptional item, lets deduct other income of Rs 33 cr. which pertains to treasury assets. We are left with an operating profit of Rs 65 cr, which on net revenues of Rs 472 cr, translates into a profit margin of about 14%. Wow! When we combine a 14% margin with a capital turnover of 18 times, we get a pretax return on capital employed of a staggering 250%! We can double check by directly comparing the pretax operating profit of Rs 65 cr with Rs 26 cr of average capital employed to get the same answer. This is one hell-of-a-business isn’t it? Two more questions come to mind: (1) Are the reported earnings real; and (2) if they are real, then what’s causing this company to be insanely profitable? Recall that from the income statement, we found that the company earned an operating profit of Rs 65 cr in FY 2010. This figure was arrived at after accounting for depreciation. The cash flow statement above shows that cash generated from operations was Rs 81 cr and if we adjust this for the depreciation of Rs 18 cr, we arrive at Rs 63 cr. 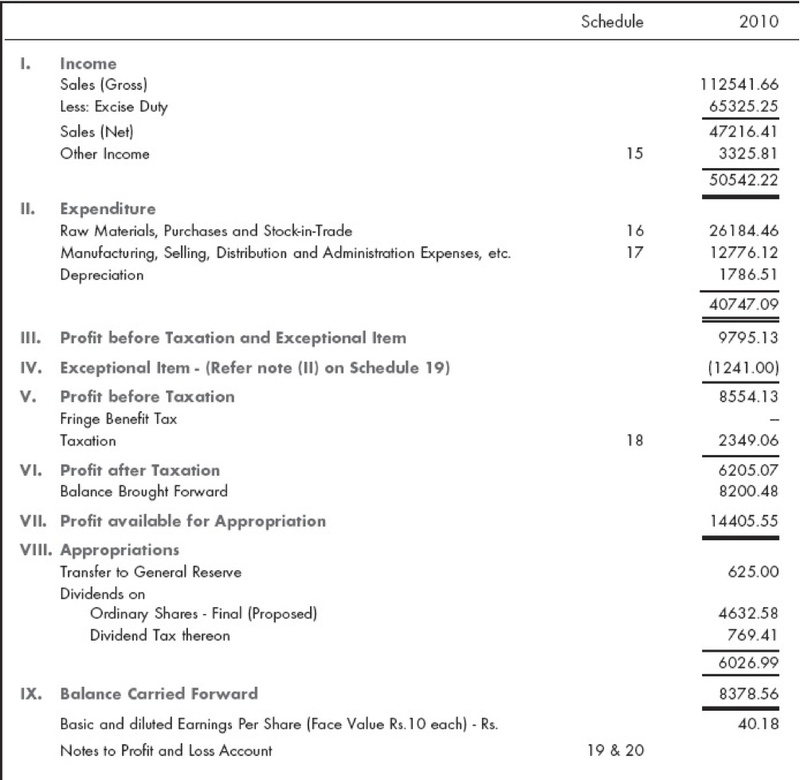 So, the cash flow statement is consistent with the earnings statement for FY 10. We can do the same analysis for the earlier years and we arrive at the same conclusion. Total cash flow from operations for these six years comes to Rs 567 cr and annual average cash flow comes to Rs 94 cr. However, since the FY 10’s number was less than the average, lets assume that number of Rs 81 cr to be our estimate of sustainable cash flow going forward. This Rs 81 cr of sustainable cash flow is an important number I want you to keep in mind. When we compare sustainable cash flow of Rs 81 cr a year with average capital employed of Rs 26 cr, we find that the company earns a cash flow return on capital of 319%, which brings us to the second question I asked earlier: What makes this business insanely profitable? It is now time to reveal the name of the company to you. Ladies and Gentlemen, the company we are examining is called VST Industries, the Hyderabad-based cigarette manufacturer which owns the “Charms” brand. I think now you will begin to understand why is this company so profitable, isn’t it? Its because its in the business of selling nicotine to addicts who are brand loyal and price insensitive. The reason for rise in revenues and profits despite lower business volume is pricing power. Price per cigarette stick has increased at an annual average rate of 13.9% a year. Every time the government increased excise duties on tobacco products, the company simply passes it on to its addicted customers. That’s pricing power, which is one the most important attributes of a great business. The next question that comes to mind is how sustainable are future cash flows of Rs 81 cr a year going to be?. To answer that question, we have to think about the likelihood of people giving up smoking. I think, we all agree, that’s not going to happen. 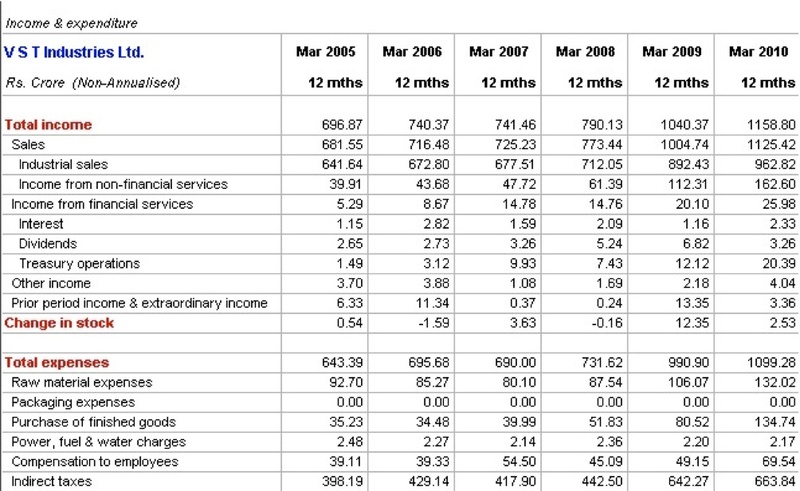 The table shows that over the last six years, VST has paid about Rs 3,000 cr as excise duty to government. Now, you tell me how likely is it that the government will kill this golden goose? Combine this with the direct taxes paid by the company and we can easily conclude that the vice of tobacco has a very good friend in the form of India’s government and so its very unlikely to ban the product. This is a major assumption we are making, however – one that we will look at later on but for the moment lets assume that there is unlikely to be any significant threat to this company’s ability to continue to sell tobacco products to a large population of nicotine addicts. Now lets shift focus from a business analyst’s vantage point to that of a prudent banker. Imagine that you are an old-fashioned, prudent banker who believes in the banking dictum that one must lend money to only those borrowers who don’t need it. What are the key factors that prudent bankers think about before deciding how much to lend to a borrower? Three factors are critical: size, cyclicality, and interest cover. Other things remaining unchanged, its prudent to lend to large companies whose businesses are not cyclical. If a business is cyclical, then a prudent banker would not depend on peak earnings. Rather, he would compute average past earnings and then ask for a higher interest cover on those earnings than would have been the case if those earnings were not cyclical. 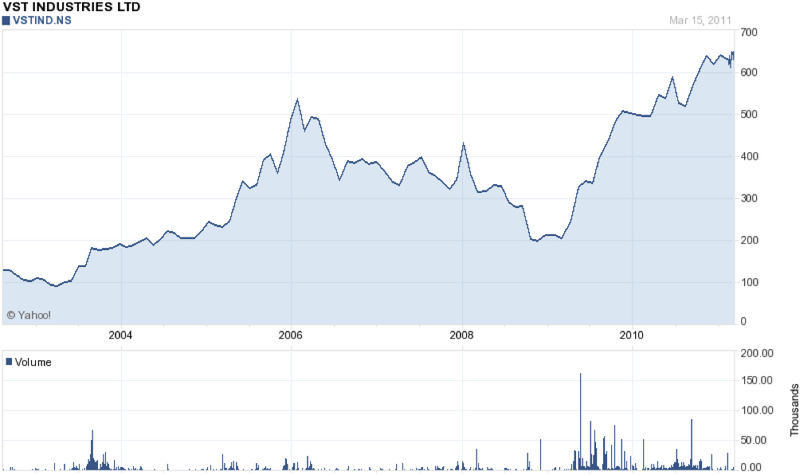 In the case of VST, we already know that the company is both large and not cyclical. Tobacco is one of the least cyclical businesses in the world, after all. So how much you, the prudent banker, would lend to VST? Let’s assume that you’d rely on the work done earlier by the business analyst. Let’s also assume that the prudent banker is happy to assume that VST is quite capable of delivering a sustainable cash flow of Rs 81 cr. a year. Let’s further assume that you, the prudent banker, would still insist upon a minimum interest cover of 3 times on the total debt of VST. Divide 81 cr by 3 and we get Rs 27 cr. This is the maximum amount of interest that VST’s business can easily afford, says you the prudent banker. Given that current interest rates for high-quality borrower are 9% p.a. at present, this means that the maximum amount of debt that you the prudent banker will be pleased to give to VST comes to Rs 300 cr. (Rs 27 cr/9%). In other words, if you give a loan of Rs 300 cr to VST, then the interest on that loan at 9% a year would come to Rs 27 cr a year which would be one-third of its sustainable annual cash flow of Rs 81 cr. So there would be a huge margin of safety on your loan because before your loan is in jeopardy, the earnings of VST must collapse by 67% which is extremely unlikely given the stable nature of the business the company is into. Paradoxically, the dangerous habit of smoking translates into safety for the prudent banker’s loan to the company. We have now arrived at an important number of Rs 300 cr as the debt capacity of VST’s operating business. Notice this debt capacity has been arrived at without considering the surplus cash of Rs 190 cr in possession of the company. This Rs 300 cr, is the amount of loan that you, the prudent banker, would happily lend against the collateral of VST’s operating assets and their cash flow. Now let’s put ourselves in the shoes of a smart value investor — someone like Ben Graham who wrote the book on Security Analysis. How would Ben think about this? And so, Ben would take the debt-capacity of VST’s operating business (Rs 300 cr) determined by the prudent banker. Then he would add the surplus cash of Rs 190 cr on the company’s balance sheet and arrive at Rs 490 cr. He would then divide this number by 1.54 cr shares outstanding which comes to Rs 318 per share. Ben Graham, the smart value investor, would be pleased to buy VST’s stock at less than Rs 318 per share. In the bear market of 2008-09, VST’s stock price did fall to below the level of its debt-capacity per share, estimated by Ben to be Rs 318. At that price, the stock was a bargain. There is an important lesson here. Smart value investors don’t always value stocks or businesses. Rather they seek a margin of safety. They know that the question ,”How is much its worth,” is tougher than the question, “Is this likely to be worth a lot more than my price?” Smart value investors keep away from making elaborate predictions. Instead, they focus on protection in the form of a margin of safety. How would a bond fund manager think about VST? Well, we know one thing about him. He certainly won’t think out of the box like Ben Graham did. Such an argument, which to me is very persuasive, won’t be so to our bond fund manager for he thinks in terms of silos. He goes by titles (like “bonds” and “stocks”) and not by economic substance. You are Henry Kravis, who virtually invented the leverage buyout. How would you think about VST? Imagine its March 2009. The world is apparently ending, and VST’s stock price has crashed to Rs 220 per share. With 1.54 cr shares outstanding, the market cap is Rs 338 cr. You have done your homework. You know that the company’s business can generate a sustainable cash flow of Rs 81 cr a year. You also know that the company has Rs 190 cr of surplus cash. Relying on the work done by the business analyst and Ben Graham, you know that the minimum value of the stock is Rs 318 per share. That’s puts a minimum value of Rs 490 cr on the company. It’s time to act. Very quickly, you incorporate a company. Let’s call it “Acquirer.” You, Henry Kravis, inject Rs 490 cr into that company, of which you borrow 90% or Rs 441 cr. The balance Rs 49 cr is your money. What do you do with the Rs 490 cr in this new company? Well, you use it to make a tender offer to all the shareholders of VST at Rs 318 per share. Since the stock is quoting at 220, your offer price is 45% above the stock price. Imagine that all shareholders of VST tender their shares to the “Acquirer.” What does the balance sheet of “Acquirer” look like after the acquisition? The cash on the asset side is replaced by a 100% ownership of VST’s shares. On the liability side, there is debt of Rs 441 cr, and equity of Rs 49 cr. VST is now a 100% subsidiary of “Acquirer.” The entire operating business of VST plus its surplus cash would now belong to “Acquirer.” You would immediately make VST borrow Rs 300 cr from the prudent banker. The cash on VST’s balance sheet would now become Rs 490 cr. The Acquirer’s balance sheet would now have cash of Rs 490 cr. and debt of Rs 441 cr + Rs 300 cr or a total debt of Rs 741 cr. You would immediately use all the cash to retire debt. As a result, the balance sheet of “Acquirer” would now consist of debt of Rs 251 cr (Rs 741 cr — Rs 490 cr). It would have no surplus cash, but would own 100% of VST’s operating business. In six years you, Henry Kravis, would own 100% of VST, which would now be debt free. You would have bought the company from its stockholders by paying them 45% more than what the stock market was valuing the company for. And yet, your own investment for this acquisition was just Rs 49 cr! In other words, in just six years, by putting up only Rs 49 cr, you would end up owning a 100% stake in a business capable of delivering Rs 81 cr of unleveraged cash flow a year. And you’ve have accomplished this by buying out the business at a 45% premium to its prevailing market price! And, so much for market efficiency! According to MM’s proposition on capital structure, under certain assumptions, the value of a firm is independent of its capital structure. One of the assumptions is that the markets are efficient. If the markets were efficient, then there is no difference between price and value and there are no bargains. There can be no Ben Graham, and no Henry Kravis either. The MM proposition on capital structure states, that if you make VST borrow Rs 300 cr the value of the firm will rise from Rs 338 cr to Rs 638 cr, comprised of debt of Rs 300 cr and equity of Rs 338 cr. The total cash with the company would now stand at Rs 490 cr. (Rs 190 cr + Rs 300 cr). Then, MM proposition on Capital Structure states, that if you were to withdraw this cash of Rs 490 cr from VST, which is exactly what Henry Kravis did, then the value of the equity will simply drop from Rs 638 cr to Rs 148 cr. Recall that the business generates Rs 81 cr of annual average cash flow and the first year’s interest at 9% on total debt of Rs 300 cr, would come to Rs 27 cr. MM on Capital Structure says that VST’s shares after the LBO, will be worth Rs 148 cr even though the business would have earned Rs 54 cr of cash flow after interest in that year! Isn’t this baloney? Well, I certainly think it is. Imagine that you are a value-oriented manager who runs VST and its March 2009 and the company’s stock is languishing at Rs 220. You know that your company’s business is capable of delivering an annual average cash flow of Rs 81 cr. You also derive comfort from absence of debt and presence of Rs 190 cr as surplus cash on the balance sheet. And yet your company is being valued by the market at only Rs 338 cr. What can you do about this? Well, you can do many things but lets just talk about three of them. You make VST borrow Rs 300 cr. Add to this the existing surplus cash of Rs 190 cr, and you now have a total of Rs 490 cr. That’s Rs 318 per share. Then, you simply declare a special one-time dividend of Rs 318 per share! Remember, the stock price is Rs 220 per share! What about MM on Dividend? Recall from your earlier work in this MBA program that MM also had a famous proposition on dividends. According to this proposition, under certain conditions (the primary one being the assumption of market efficiency), the value of a firm is independent of its dividend policy. The proposition states – and all finance textbooks swear by this as if its the holy grail of finance – that if a company pays a dividend then on ex-dividend date its value will simply fall by the amount of the dividend paid. The theory further states that investors should be indifferent between dividends and capital gains because what they get by way of dividends, they will lose by way a decline in the market value of their shares. And if a firm does not pay a dividend, they will have equivalent capital gains on the stock. Well, let’s apply this “theory” to VST. If VST’s stock price before the dividend announcement was Rs 220 per share, then after the payment of Rs 318 per share of dividend, its stock price should become negative Rs 98! Is that possible? Can stock prices be negative? Of course not. Ok, lets grant MM this. Let’s say since the price can’t be negative, but because MM on dividends is holy grail, we have to grant to MM that the stock price of VST post dividend of Rs 318 will go to zero! How can this be? Let’s just do the math again. Recall that what the company paid out as dividend consisted of its surplus cash (which, by definition it does not need to generate its annual average cash flow of Rs 81 cr) and Rs 300 cr borrowed. This Rs 300 cr borrowed can easily be serviced the operating business. We already know this from the work done by the business analyst earlier. We also know that the first year’s interest expense at 9% interest rate on Rs 300 cr of debt will be Rs 27 cr, leaving the company with cash flow for equity of Rs 54 cr. (Rs 81 cr gross cash flow less Rs 27 cr of interest). How can a business that earns Rs 54 cr of cash flow after meeting interest requirement be worthless? This is an example of proof by contradiction, something you read about when you were in school. Well, its a trick, I advice you to use more often in much of everything you do. We can never really prove anything. Nassim Taleb says if you want to prove the propositions that “all swans are white” then you can’t prove it by looking for white swans. If, for example, you see thousand swans and all of them are white, that does not prove the proposition that all swans are white. You can see a million — a billion swans — and if all of them are white that does not prove that all swans are white. But a single sighting of a black swan disproves the notion that all swans are white. So, you just have to learn this trick of disproving much-loved but wrong ideas in finance and other fields by looking for contradictions. The example of VST’s special dividend is the functional equivalent of the black swan. It’s a contradiction that kills the MM Proposition on dividends, isn’t it? You have Rs 190 cr of surplus cash plus you have debt capacity of Rs 300 cr which you utilize and now you have Rs 490 cr. You want to teach the stock market a lesson by valuing your company for only Rs 338 cr. You are feeling angry at the market and you are feeling bold. You know your company’s stock is worth a lot more than its current price of Rs 220. You announce a buyback at Rs 500 per share! Lets find out by doing the math. How many shares of the company can be retired at Rs 500 per share by using all of the cash of Rs 490 cr. Divide Rs 490 cr by Rs 500 per share and you get 0.98 cr shares, which out of the total existing 1.54 cr shares amount to 64% of the equity. Let’s imagine that you go and implement this bold buyback plan and assume that its executed successfully. What will be the consequences? The company would be left with only 0.56 cr shares. All the cash would be gone. There would be a debt of Rs 300 cr. But the company would still possess the operating business capable of delivering annual average operating cash flow of Rs 81 cr. Reduce first years interest of Rs 27 cr on the debt, and we are left with Rs 54 cr of cash flow for equity. Divide that by the remaining 0.56 cr shares outstanding, and you get cash flow of Rs 96 per share! If MM is correct, then post buyback the value of the firm should simply fall by Rs 500 cr used for the buyback. The value of the firm before buyback was Rs 338 cr. Then it took Rs 300 cr of debt and the value rose to Rs 638 cr. Now, post buyback, according to MM, the value of the firm should fall to Rs 148 cr. But since there is debt of Rs 300 cr, according to MM, the stock price should become negative and since thats impossible, then it will surely go to zero. You have Rs 190 cr of surplus cash. You can borrow Rs 300 cr but you don’t do that. Instead of actually borrowing the money, you go and create bonus debentures worth Rs 300 cr and allot them proportionately to your stockholders! Let me explain. We already know that the company can easily service Rs 300 cr of debt. But we dont need the company to actually borrow money. We can simply create a debt instrument out of thin air and distribute it to our stockholders. Let’s say the face value of every debenture we create is Rs 100. So there will be a total of 3 cr debentures. Let’s say the interest rate VST will pay on these debentures is 9% a year. The company has 1.54 cr shares outstanding. These shareholders will receive 3 cr debentures. This means that for every one share, 1.948 debentures would be simply be given to the stockholders as bonus debentures. If a stockholder owns 1,000 shares, their market value before the bonus debentures was Rs 2.2 lacs. Now this stockholder will receive a total of 1,948 debentures. How would the bond market value these debentures? Since these debentures have a face value of Rs 100, a coupon of 9% a year which is the going rate of interest, and since the company would be very credit worthy even after these debentures were created, we can safely say that these debentures would be priced by the bond market at Rs 100 each. The aggregate market value of these debentures in the bond market will be Rs 300 cr. The stockholder who owns 1,000 shares in VST worth Rs 2.2 lacs would receive 1,948 debentures, which would have an independent market value of Rs 1.95lacs, and he would still own all the shares! The value-oriented manager did not change anything on the asset side of VST’s balance sheet. All he did was to create a prior claim and transfer it on a piece of paper called “debenture.” This debenture would be valued by the bond market independently. The bond market would correctly value 1,948 debentures at Rs 1.95 lacs and all of the 3 cr debentures at an aggregate value of Rs 300 cr. If you were to believe MM on Capital Structure, however, the value of the investor’s 1,000 share would drop by Rs 1.95 lacs, from Rs 2.20 lacs to Rs 0.25 lacs and end up selling for Rs 25 per share. The stock would drop to Rs 25, says MM, because there was no change on the asset side of the balance sheet! There was no new cash coming into VST or going out of VST. MM on Capital Structure says that if the total value is to remain unchanged, and if we create debentures out of thin air, then the value of the equity shares must simply shrink by the exact amount of the value of the debentures. If MM is right, then the creation and distribution of 3 cr bonds worth Rs 100 each, should result in the drop in the value of the equity by exactly Rs 300 cr – that value would drop from Rs 338 cr to Rs 38 cr or Rs 25 per share. And yet,this Rs 38 cr market cap company would be capable of earning cash flow for equity of Rs 54 cr. (see our computations in “Special Dividend” section above). Do you really think that the market would value a firm capable of earning Rs 54 cr a year for Rs 38 cr? How can the bond market value a claim on only ONE-THIRD of cash flow for Rs 300 cr, but the stock market value a claim on ALL of the cash flow for only Rs 338 cr, which still having surplus cash on balance sheet of Rs 190 cr? Don’t you see the contradiction here? Either the bond market is right, or the stock market is right. Both of them can’t be right! That would be impossible isn’t it? Improbable as it may sound, ladies and gentleman, our method of analysis shows that its the bond market was right by valuing a small part of VST at Rs 300 cr and that stock market was wrong by valuing the whole of the company at Rs 338 cr, not evening counting Rs 190 cr of cash! The important lesson from the three examples of special dividend, buyback, and bonus debentures is this: A value oriented manager can always do these things to force the stock market to correct its valuation mistake. Moreover, one does not need a Henry Kravis to take VST private using an LBO and enjoy all subsequent benefits for himself. The value oriented manager can achieve the same objective using bonus debentures, allowing the company’s stockholders to benefit from the creation of leverage on VST’s balance sheet. Recall also that Ben Graham’s abstract idea of a “hidden bond component inside the stock of VST.” Well, the value oriented manager can literally use that idea to deliver to his company’s stockholders an actual bond instrument having an independent market value, thereby forcing the market to correct its valuation error. We have come quite far in our investigations. But there is still one vantage point left — that of civilization. None of the witnesses we have met so far have looked at the company from the civilization’s viewpoint by incorporating what Charlie Munger calls “virtue and vice” effects. I said earlier, that you’ll get closer to the truth by having access to several vantage points. So let’s examine this last vantage point. Zoom out a bit and look at what’s really happening here. How does VST make money? What do you see? I will tell you what I see. I see that VST makes money essentially by selling something that kills people. I know its legal to do it, otherwise VST would not be in the business of selling tobacco. But that does not change reality does it? Consider this: If tobacco was discovered today, and the world knew about its horrible effect on the health of smokers, would it be legal to sell it? You see, things carry on, because they have carried on. The tobacco business is legal because its been around for so long and societies have this status-quo bias, this inertia which prevents them from change. Moreover, the tobacco lobbyists, who don’t want this change, are very powerful. Plus, of course, the government depends on the tax revenues. 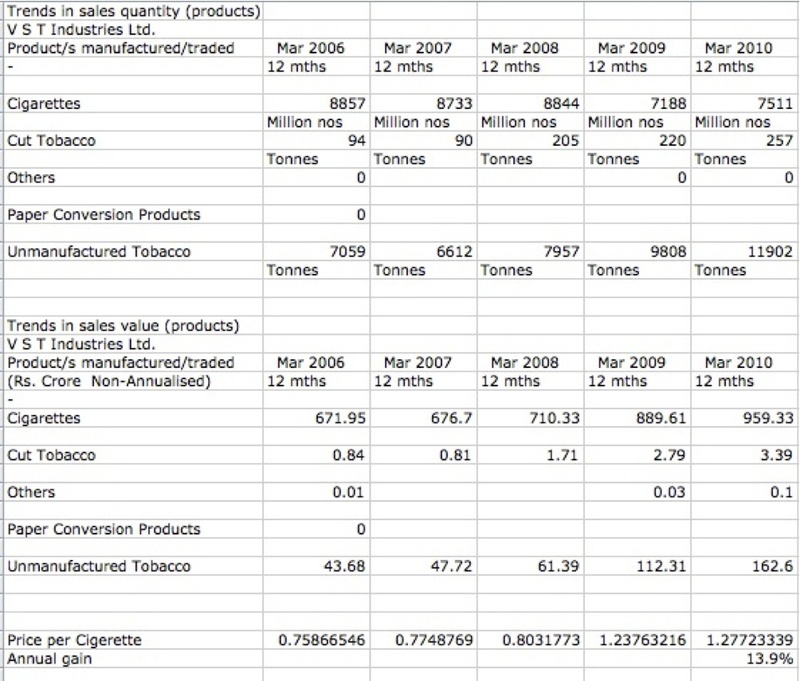 What are the real costs of tobacco? I think we all agree that the real cost of tobacco is hardly in the cigarettes sticks. The real cost comes the form of disease and misery caused to smokers and their loved ones when they die from cancer. That real cost is borne not by the tobacco manufacturers, but by society. Privatized benefits and socialized costs is what makes VST prosper. How long will this last? I can’t say. Will you buy the stock? I don’t know. It’s really up to you. If you see this from the vantage point of a Ben Graham or a Henry Kravis, then maybe, at a price, you will. If you see it from another vantage point, perhaps, you won’t – at any price. The choice really is up to you. Moreover, you can rationalize whatever you choose. Man, after all, is not a rational animal. Rather he is a rationalizing one. I do know, however, that you get closer to the truth by having multiple vantage points. Having just one vantage point in a detective story is not good enough.Having eight is rather cool. Note: An abridged version of this post will be published in the next issue of Outlook Profit. This is by far the best analysis of any company ever read…Its to be remembered for life time lesson. Their is just one clause (or trap so to say) that the stock price discussed is of 2008-09 but the financial statements used are till 2010 hence one needs to extrapolate these financials till 2010 in the bleak times of 2008-09 to come to this conclusion. Having said that, this is what it takes to be a real value investor, see what others cant see over the mountain of pessimism and ride the opportunity of being rich. Thanks professor for teaching such a beautiful lesson of vantage point. There were many other example in 08-09 of such companies, with cash on hand, 5 year continuous top and bottom line growth, good dividend history. First could not captured its glory of Sas Bahu serials again. Second one’ profit reduced by 90% in spite in the previous year management claimed that their business is recession proof (as most of business is linked to govt), I sold stock for 100% profit compared to 1000% at current rate. Superb Sir! Excellent Analysis and explaining it different form ‘Vantage Point’ was the best! If I am not wrong Rakesh Jhunjhunwala did buy VST around that price. The beauty of the analysis is beyond words. This is a piece of art. BTW was just checking VST …..barring the move in the last one month has been performing in line with the BSE small cap index over last 5 years as well as from the lows of March 2009(not adjusting for the dividend) … guess that should change going forward ??? Great piece of art once again. One thing you could have highlighted more was the dividend yield of VST at Rs 220. Had one bought VST even at realistic levels of Rs 300, on FY10 profits , the dividend yield works out to be 10%. I am a firm believer of investing in businesses where my desired return is provided by tax free dividend and the capital appreciation is the icing on the cake. I like what you have said “…my desired return is provided by tax free dividend and the capital appreciation is the icing on the cake.”. Have you found such business in India? Indian market is full of such opportunities… you just have to find them. The stock price before the dividend announcement is assumed as Rs.220 and a dividend of Rs.318 is announced. As more investors will come to know about this tax free dividend scheme and the subsequent punter’s activity will increase the stock price by at least Rs.318 to Rs.538. After the ex-date and as per MM the stock price should fall to Rs.220 (538-318). This price will still be a bargain because of Rs.300 cr of Debt + Rs.190 cr of cash. So the stock price even after this scheme will have to be more than Rs.318 to reduce the bargain. Your take on MM is correct but you forgot about the market activity after announcement but before ex-date. Choices, contradiction, combined intelligence of humanity, Irony. a very insightful & educative piece. Thank you for penning this multi-angle analysis. Harboring multiple views simultaneously is really an acquired, but important skill. Fantastic work, Professor ! The article is undoubtedly head over shoulders compared to finance stories out there. But I think the form can be a bit modified. When different points are shown, I think it would be good if they finally tie up. I feel all the narratives are left hanging here. I didn’t like this movie much which followed what Kurosawa did in Rashomon. In my opinion, the movies Rashomon and Yuva (loosely based on Rashomon) have as the final part some interaction between the earlier shown characters and something is revealed because of the interaction. Vantage Point just shows what happens in the end. Babel doesn’t do either. The first seven narratives kind of show but the last one tells instead of showing us what’s happening. I think the last narrative can be what the earlier characters do. I am sure what this can be. An excellent post, which while being easy-to-understand is also profoundly educative. Being a novice value investor myself (just 3 years into it), I remember a discussion I had with a B-school friend of mine a year ago, where he waxed eloquent on Miller-Modigliani and why debt is always good for a company compared to equity. Having no B-school background and hearing about the MM theorem for the first time, I intiutively felt something wrong (probably because I had been reading up on Buffet and let go of EMT) but could not put my finger on it. I neither had the knowledge nor the experience to convey my impression. Your post has now made it as clear as daylight for me. Thanks a lot for the time you spend in educating the rest of us. Excellent analysis. Have come to believe that awarding Modigliani with nobel for his theory was the biggest mistake in Nobel history. Thank you for sharing this marvelous piece of work. I have one query: does the intrinsic value arrived under Graham’s vantage point is essentially referring to the “book value”? Please clarify. This blog was excellent to read. Will be reading all your posts. Seems I will get excellent insights on my goals to become an investor and an educator here. Brilliant article sir. One of the best which I have read. After spending a fortune on formal education in Finance, I have realized a lot of things, including the fact that, theories that filled up the expensive texts books, left a student like me with amateur knowledge at best; totally worthless at providing any conviction at all in attempting investment en-devours. The article has been an eye opener and I would think would make an excellent theme for a book and a great service to finance students! Professor, I have commenced the journey of reading through Security Analysis and am finding it extremely insightful but equally laborious. I hope to relearn some ideas finance theories. Thank you for the excellent list of books you have recommended on Amazon. Hello Prof. Bakshi, I m pretty new to value investing models and recently read ur old post at Oxford Bookstore three themes on val investing. What I discovered is in ur CIO article where u addressed people abt 2nd theme ie of debt capacity , you used avg PBIT while here in this very post u r using avg operating cash flows . can u plz tell y u switched from PBIT to CF’s ?? What are the chances of my success if I don’t talk to management viz-a-viz someone who can talk to the management? Why have you not posted anything on your blog since 3 months. In this case, the company was holding its surplus cash in the form of marketable debt funds. What if a company holds its surplus cash in the bank as fixed deposits? In that case, the ‘Cash and bank balances’ would include the cash required for day to day operations as well as the surplus cash. How can we determine what portion of the cash is surplus to the needs of the business? The schedules only give details of the amount held in current and in fixed deposits. But since fixed deposits can have maturities ranging from a few days to several years (and the maturity pattern is not disclosed), is there any simple way of estimating the surplus cash on the balance sheet? I am basically a Software Programmer and interested in long term investing. Whenever I buy Profit Outlook Magazine, first I look if you have written any articles. All are articles written(though very few) are really good. Thank you for this excellent article presented in a simple and interesting way. It is easily understandable even for a person like me who does not have accounting knowledge. I feel, it could have been more helpful if you had analyzed a company that has debt in its Balance Sheet. If possible and time permits, could you please write an article analyzing a company with debt since 95% of companies have debt. The analysis is not only sequential but also comprehensible for a layman. Actually, post buyback, the value of the firm should not change according to MM; the cash decreases and equity decreases, and the firm value (EV) remains the same. Similarly, when the firm takes 300 cr of debt, the firm value (EV) remains the same; cash goes up and debt goes up and net debt remains the same. Can you please clarify if this understanding is correct as per MM. @rjt163: if equity decreases, how can its value remain the same? In case of buy-back, the equity decreases, but cash also decreases by the same amount and hence there is no effect on the firm value. Ofcourse, all this is in a theoretical world (MM), practically, buy-backs change the value by giving signals and changing the capital structure. i dont understand this equation. if u have a firm with no debt, and its only asset is cash, then firm value is zero? Dear Prof, I am replying in a new post as I don’t see the reply option in the old comment. Taking the same example of firm having assets of 1,500 cr with 250 cr of surplus cash. What is the value of the firm, lets say I have to buy this firm, how much shall I pay for this firm – and the answer is 1,500 cr. But at the same time, I am also getting 250 cr of surplus cash, which I immediately take out from the firm, and so my net purchase price for the firm is only 1,250 cr. Thus, 1,250 cr represents the actual value of the firm. This is the same value after the buy-back as well. I have not understood your point here. Value of Firm = Value of Operating Business + Value of Non Operating Assets. Rs 1,500 cr = Rs 1,250 cr + Rs 250 cr. Value of Firm is Rs 1,500 cr. Value of Operating Business is Rs 1,250 cr. and Value of Non Operating Assets is Rs 250 cr. Value of Equity in the firm = Value of Firm – Value of Debt. Value of Equity in the firm = 1,500cr. – Rs 100 cr. = Rs 1,400 cr. Now the firm does a buyback, using all of the surplus cash which was the only non operating asset. Cash goes out and nothing else comes in. Value of Equity in the firm = Rs 1,250 cr – Rs 100 cr. = Rs 1,150 cr. So value PER SHARE post buyback may go up, down or remain unchanged, depending on the price at which the buyback was done relative to intrinsic value of shares prior to the buyback. But the TOTAL VALUE of EQUITY in the firm MUST DECLINE post a buyback because cash is flowing out and nothing is flowing in to compensate for that outflow. What you are calling Enterprise Value, I am calling Value of the Operating Business. They say, give a hungry man a fish and he will be ok for the day. Teach a man to fish and he will never be hungry all his life. What this article did here was exactly teaching how to fish. Based on the principles set out in the article above, I was able to analyse a stock called Atul Auto today and come to my own conclusion on the price I would like to buy it for. Felt great Felt informed, and felt grateful to you. Sir, nothing ever written or spoken has ever made me understand investment concepts the way this article did. You just got one more fan in me! BTW..the 8th vantage point has always ruled in my investment decisions. So I have never even attempted valuing ITC, VST Industries, etc. Though I have position in VST group’s another business – VST Tillers & Tractors. But there is one confusion between, here in case of VST, and, one example of CONCOR, given in lecture 13 of BFBV. In case of CONCOR while arriving at Value of Business, we consider one more of, Equity Value >.75 Debt Capacity, but not here in case of VST. Any particular reason for that. I was trying to value pidilite using the prudent banker and Ben graham’s views. However I am getting a value which I cannot understand. Below are my workings, please correct me if I am wrong. Pidilite CFO from 2007-13 is 2140 Crs, average during the same period being 305 Cr. I take the average and an interest cover of 3 therby getting 101 cr. Assuming interest rates to be 9%, prudent banker will be willing to lend 1100 Cr to pidilite. Pidilite has cash& equivalents of 430 Cr. Now Ben Graham will be willing to pay 1530/51(no of shares outstanding) = 30. What am I missing here?. Sir,this is one of the best articles I have ever read on investing.Thanks for spreading knowledge this way.Envy your students! I have some confusion regarding the Vantage point Business Analyst point of view.While calculating Capital employed by the business Average Working Capital was subtracted from Average fixed assets; Was the working capital deducted because the figure was negative?Would working capital have been added to the fixed asset in case Working Capital was positive?Thus can it be concluded Companies with Positive Working Capital are less efficient compared to Negative ones? As I come from a Non-commerce background & have limited knowledge about financial statements was a little baffled..
Dear Sir, I stumbled on your website randomly while browsing the net. I was blown away with the depth of knowledge you have given thru just one article. I salute you and appreciate your teachings of thirsty students like us. This is by the far the best article I read on investing. Thank you.